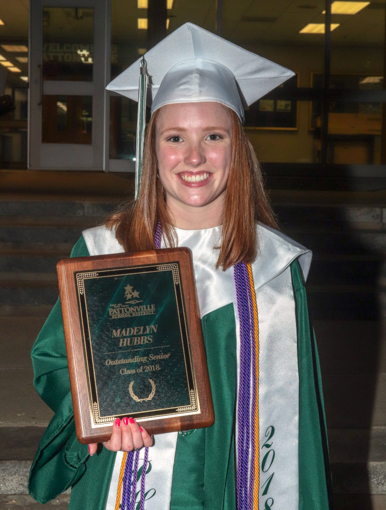 Pattonville High School senior Madelyn Hubbs was named the Outstanding Senior for the Class of 2018 during Senior Awards Night on May 23. The Outstanding Senior is chosen each year from teacher nominations. 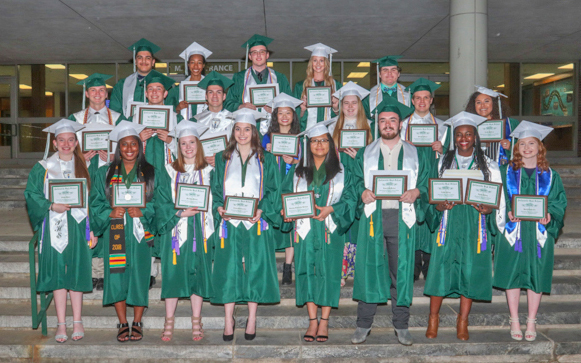 The high school also honored several seniors with Outstanding Senior Departmental Awards and other special recognitions. Each department recognizes one student who has shown outstanding academic achievement, leadership and citizenship. This year’s Outstanding Senior Departmental Award winners are: Sarah Baker, health sciences; Brittany Bell, Pirate Press newspaper; Shawn Boswell, modern languages (German); Aaron Garner, vocal music; Bria Griffith, family and consumer sciences; Patrick Hachmeister, speech and debate; Aaron Hautekeete, mathematics; Emma Hohenstein, business; Madelyn Hubbs, community service and Thomas Frick Student Service Award; Christie Jiang, orchestra; Nadia Maddex, ECHO yearbook; Brendan McBride, physical education; Ashley McFadden, English language arts; James McMahon, social studies; Michael Pieper, technology and engineering; Haley Reynolds, theater; Grace Skelton, art; Susana Solorzano Hidalgo, English language learners; Emma Stubblefield, band; Lydia Young, modern languages (French) and science; and Fahad Yousif, skilled technical sciences. The following special awards were also recognized: Missouri State High School Activities Association (MSHSAA) Sportsmanship Award - David Ellison Jr. and Makayla Jones-Scott; St. Louis Post-Dispatch Scholar Athlete - Katie Basta; Four-Year Perfect Attendance - Lakaila Ellis, Louis Johnson and Nicholas Krueger; and National Merit Award - Grace Skelton. 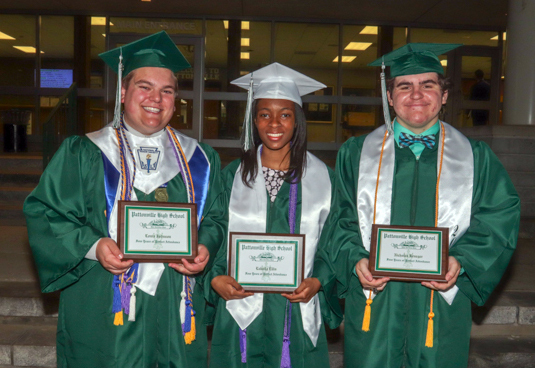 View photos from the Senior Awards Night. Shown are seniors who earned Outstanding Senior Departmental Awards. Shown are seniors recognized for achieving a four-year perfect attendance rate.